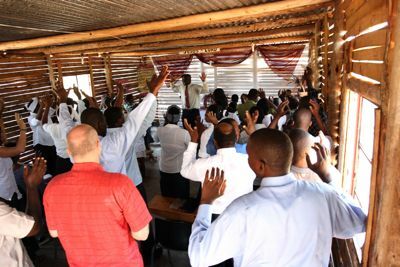 The service continued on with more singing and talking, sharing and giving of tithes and offerings. I loved their idea of tithing! They had a continued competition between the congregation. They were all divided up into two groups. Every Sunday, they would sing and dance up to the offering bowl in their group, and find out at the end of the service how each group did. What a fun church ritual and a reminder that giving of our money should be given in a joyful manner! After the end of the sermon, the pastor invited Todd up to speak. I think that they wanted him to give another sermon! Todd did great. He related his words to the previous pastors and talked about faith by bringing up the story about David’s battle with Goliath. He talked about the giant the we all face in our lives…and that we need faith to overcome them. Carolyn also spoke to the kids to tell them how special they were to God. Wow! The four of us were so moved by the passion and faith of this small group, that we left with our hearts beating for God and His spirit here. I thought of you all back at home and wished you were here to experience this! Thanks for the comments on the blog. The small contact we have means a lot to us.